The 18-month-old party will declare the remaining six or more candidates in the ensuing days. 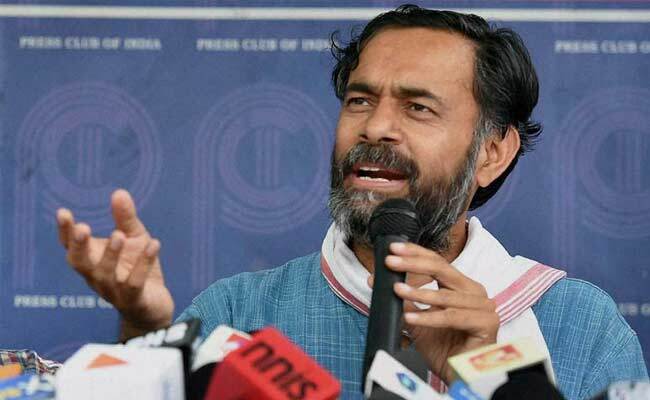 Bengaluru: Swaraj India, led by psephologist-turned-politician Yogendra Yadav, would contest in a dozen seats in the May 12 Karnataka Assembly election, said an official on Tuesday. "As a new and young party, we are making a modest beginning to contest in a dozen assembly constituencies in the state to usher in probity, transparency and accountability in electoral politics," Swaraj India Spokesman B. David told IANS here. Releasing the first list of candidates, Yadav said the party would contest two seats in Mandya district, one each in Bengaluru, Chamarajanagara, Chitradurga and Yadgir districts. The contestants are Darshan Puttannaiah from Melukote and S.H. Linge Gowda from Maddur in Mandya, K.P. Bhoothaiah from Challakere in Chitradurga, S. Srikantaswamy from Hanur in Charamajanagar, Ramesh Chandra from Mahadevapura in Bengaluru and Vaijanath Patil from Yadgir in the state's northwest area. The 18-month-old party will declare the remaining six or more candidates in the ensuing days, as the Election Commission will notify the Assembly election on April 17, with April 25 the last date for submitting names and April 27 for withdrawal in the single-phase poll. The counting of votes is on May 15. Deploring the ideological and political vacuum in the country, Yadav told about 200 members of the party's state unit that there was no political force in the country to strengthen democracy, diversity and development. The party's state unit coordinator Devanoor Mahadeva said the country was facing a strange situation due to global warming. "This is not a political issue for polls but the absurd development was causing inequality, new diseases and challenges across the country," he said. Darshan Puttannaiah is the son of the state's farmer leader late K.S. Puttananaiah, who was a member of the outgoing state assembly. He represented the Karnataka Sarvodaya Paksha which merged with Swaraj India in March 2017.